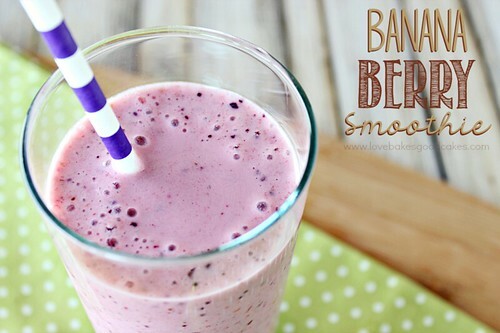 How fun does “Berry Milk” sound? And the fact that it can be purple, blue or pink – add that to the cool factor! My kiddos think this stuff is awesome – and I like that I know all of the ingredients! Oh, and it’s sooooo simple to make! Let me be clear … I am not a fan of milk. I think it’s gross. (Sorry, milk fans!) 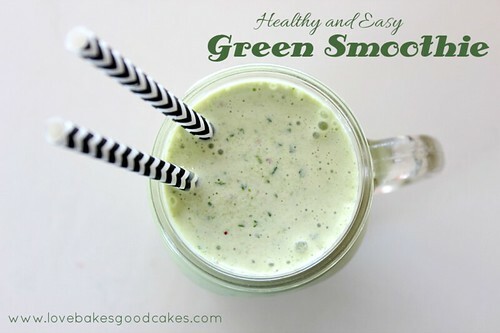 I drink maybe 2 or 3 cups a year – and it must be flavored or hidden in milk shakes! 🙂 Sure, I could make chocolate milk …. and I have …. but every once in awhile, I do want something “different” to drink. My kiddos on the other hand, love milk – and I usually have no problem getting them to drink it plain. 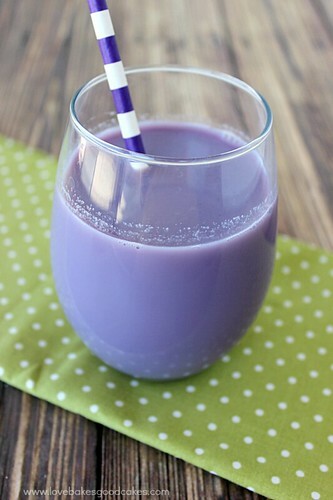 But, they do love this fun purple Berry Milk, too! You can use any combination of berries your family likes or what you have on hand for this! Obviously, for pink milk, use all strawberries or raspberries …. 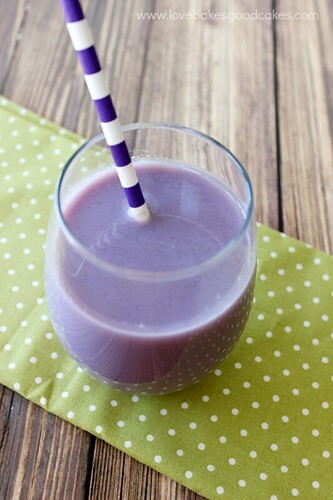 for purple, use a combination of strawberries and raspberries with blueberries! I always have frozen berries on hand – and that’s what I use for this drink, but you can certainly use fresh – especially since they will be coming into season soon! I buy the bags of frozen triple berries at my local Walmart – it has strawberries, raspberries and blueberries in it, making it perfect for this drink! In a small saucepan, combine the berries, sugar and water. Bring to a boil over high heat, stirring occasionally. Reduce heat to maintain a boil and cook for 10 minutes. Using a mesh strainer, strain the mixture over a bowl. Discard the berries or save for another use, if desired. Allow the syrup in the bowl to cool slightly. Add about 3-4 tbsp. (or desired amount) of the syrup to two glasses. Divide the milk between the two glasses. Stir to combine. Serve! Refrigerate leftover syrup. When ready to use, add desired amount to milk. That looks so refreshing! Have a great day! B.t.w I'm visiting from Fluster's Creative Muster. Good idea Jamie I've been looking for ways to flavor and sweeten my homemade kefir it would be great for yogurt too. Oh neat! 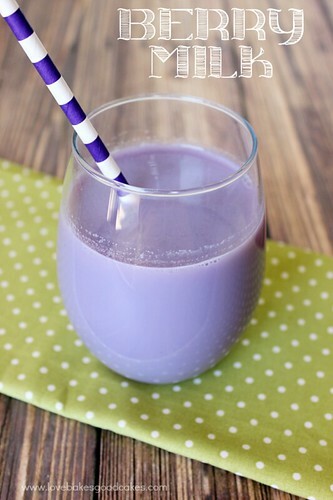 This is like homemade syrup for flavoured milk. Thanks for sharing at Simple Supper Tuesday. Interesting! I would've never thought to make my own flavored syrup for milk. Definitely have to give this a try! Visiting from Link Party Palooza! This looks delicious! I think I'll mix up a batch soon. We love milk, and usually do chocolate if we go flavored, so this will be a nice twist for the kids. I love this!! Better then adding chocolate or strawberry syrup!! Thanks for sharing at The Weekend Retreat, Hope to see you back on Thursday.